MELBOURNE, Australia — It might strike you as you ride a free Circle Line tram past the cheerfully modern headquarters of the National Australian Bank in Melbourne's resurgent Docklands precinct. That's where you meet "Cow Up a Tree," a boxy bovine suspended legs-up in metal branches by Australia-born sculptor John Kelly. Or the thought might dawn curbside by the State Library - sober with its stone columns - where the merrily painted bases of the light poles could pass for outsized Italian vases. Or perhaps farther up Swanston Street, where three long-limbed, cast-bronze businessmen seem perplexed by the swirl of shoppers, school groups, and dark-suited professionals. "Marvelous Melbourne," Australia's second city, wears her art the way an Outback bushranger wears his wide-brimmed Akubra under the baking December sun: everywhere, all the time, and not the least bit self-consciously. If you come to catch the Jasper Johns and Andy Warhol retrospective at the National Gallery Victoria International in the city's Southbank district, in other words, you might leave just as impressed with quirky works you had no plans to see. Art occurs just often enough along this city's public ways that each encounter feels like a singular discovery. CROSSINGS: The view across the Yarra River from Melbourne's Princes Bridge shows Australia's cosmopolitan side. It isn't all incidental. Federation Square - where the NGV's Ian Potter Centre houses more than 20,000 Australian works of art - has, by most accounts, become the city's cultural heart since its opening in late 2002. It's an ultramodern outpost on the banks of the Yarra River. The building's fractal facade features more than 22,000 same-size triangles of sandstone, zinc, and glass. 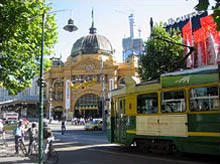 Viewed from the eastern end of Flinders Street, "Fed Square" (Aussies shorten everything to a pet name) sets off the Edwardian baroque face of Flinders Street Station, only yards away. All around town cranes loom over new construction, but Melbourne's colonial past seems to hold its own architecturally - countless old churches proudly nestled among offices and banks of shimmering steel and glass. Just across the Yarra River, in the Southbank, stands the Arts Centre, its 531-1/2-foot white spire jutting Eiffel-like into the sky above a nest of performing-arts forums, including the state opera and ballet. 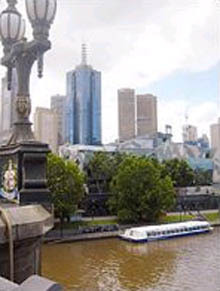 Long, low boats ply the river near Princes Bridge. As night falls, a neon glow warms the walls of newer structures, suggesting just a hint of Miami that broadens Melbourne's old "Paris of the Antipodes" handle. In other ways, Melbourne's character reflects its place along the Pacific Rim. Some of its best restaurants are Indonesian, Malaysian, and Thai. After dark, Chinatown thrums. Asian teens roam in modified Nissan Skylines, exhaust pipes growling, and an old sign painted on an alley's brick wall - Commit No Nuisance - seem a little dated, though the city does feel safe and locked-down at all hours. 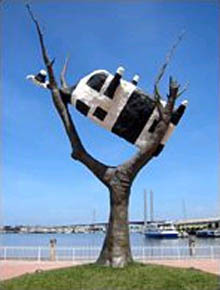 'Cow Up a Tree' turns heads in the city's Docklands. 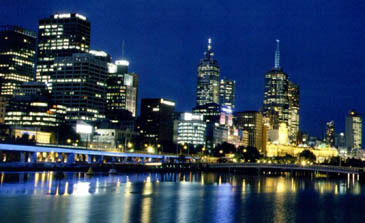 Melbourne drew the world's attention when it played host to the Olympics in 1956. Somewhere along the way to winning the "most livable city" title earlier this year from the Economist Intelligence Unit, its second straight title, the city lost its place as Australia's economic power center to big-sibling Sydney up the coast. It had been surpassed in population back at the turn of the century. Today the two cities maintain a teasing rivalry - friendly, but with an edge. "They call us Mexicans," says one Melbourne resident. "You know, south of the border" and relatively undeveloped. Partly as a result of its No. 2 status, Melbourne (say MEL-bun, please) and the state of Victoria have become first-rate strivers. In recent years, state officials have concentrated on polishing and promoting. That has fostered a creative openness in this city of 1.7 million people. In the mid-20th century, the arts scene - and Australian life in general - was all about assimilation, says Melanie Doreleyers. She and her husband run a gallery that showcases aboriginal paintings, an old art form winning new support and attention as more Australians recognize its cultural importance and rising investment value. "Now," she says, "the emphasis is on differences." Along those lines, Melbourne's arts offerings have gone kaleidoscopic. The essential guide to its galleries is the Art Almanac, which had 166 illustrated pages for November. It can be found in most bookstores for about $2.25 (US). For an overview of the performing arts, stop at a city information kiosk for the free Arts Centre Event Guide. The National Gallery of Victoria's NGV International - four airy levels - can devour the better part of a day, exposing visitors to historical Asian and European and ancient Greek and Roman art, as well as contemporary works and new mediums. Australia's contribution to film finds recognition at the Australian Center for the Moving Image, which also celebrates international moviemaking and houses digital studios that allow guests to play filmmaker. Next door, the NGV's Ian Potter Centre showcases Australian art. Follow the Icons of Australian Art Trail to hit all the highlights, including some stunning contemporary aboriginal works in ochre. But a more grass-roots look at current Australian painting - a chance to smell the paint before it dries - calls for a walk east from the city center to quiet Albert Street and the Victorian Artists' Society. With no government support, its 30 or so members get by teaching and renting gallery space, says Ted Dansey, the society's secretary. Established in 1870, the place exudes a university art-studio feel. The paint on the staircase is chipped, a few light sockets hang empty. Upstairs, two members show their still-life and impressionist work. A plate by the front door invites coin donations. Mr. Dansey seems pleased to have had a guest - local media attention, he says, is scant. He hurries into his office and emerges with a parting gift - a book published at the society's centennial. Its pages give off a pleasant old-book smell. A few days in Melbourne suggest the warm gesture is in character. Locals ride the Circle Line alongside map-clutching tourists, weighing in with good advice. The best of Melbourne, of course, can be found on foot. In a moment that seems choreographed, a driver amiably yields to a bride and groom as they just miss the clicking crosswalk signal and hustle to cross tony Collins Street, the bride gathering up her dress. On the near side, a tiny wedding guest lags behind on the sidewalk. Like any city, Melbourne has its lowlights. For every artistic jewelry designer - jumping up to show a visitor a one-of-kind opal pendant - a handful of others hawk slivers of the stones at "50 percent discounts." ACCESSIBLE ART: A tram in Melbourne, where public art shines. 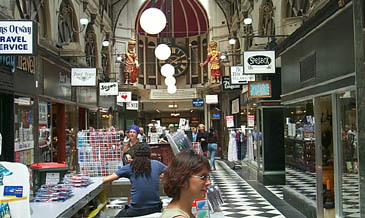 Queen Victoria Market in the city's northwest sounds alluring and has a meet-the-locals upside - one section of it is devoted to organic produce and eggs. But the bulk of its offerings seem to be goods as cheaply made as county-fair prizes - a plastic "weasel ball" with protruding tail, a T-shirt depicting the American rock band Slipknot. Yet even in this city of art everywhere, some of Melbourne's vaunted public art draws critics. A bright-yellow piece of ironwork called "Vault" reportedly caused a stir when it hit City Square a few decades ago. It was given the nickname "yellow peril" and banished to a less conspicuous spot. Most newer installments stay put to become part of the scenery. As landmarks, they can be useful, helping a wanderer find his hotel in the dark. If that's the colossal, track-mounted sculpture "History-Making Apparatus" - and who could mistake it for anything else? - then this must be Russell Street. This must be Melbourne.